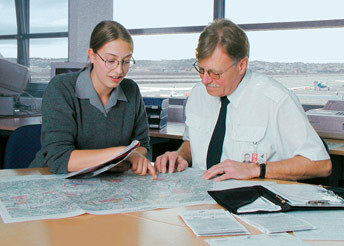 Kurz Aviation Service runs a common briefing room, cooperating with the German Meteorological Service (DWD) and German Air Traffic Control (AIS). All current information from the DWD and AIS is directly accessible round the clock. Service staff are pleased to help you in getting and adjusting slots. Additionally, you can call up meteorological data. Crews also have internet access and WLAN so they can access their firms own briefing systems. Outside service hours, you can access the information necessary for your flight via the communication network in the briefing room.